Last Tuesday evening, June 9, 2015, Rev. Drs. Ligon Duncan and Sean Lucas, both pastors in Mississippi, stood up to make a personal resolution on the floor of the General Assembly of the Presbyterian Church in America. That resolution called the General Assembly to confess our sins regarding our complicity and involvement in racial injustice during the Civil Rights era up until the present day. These sins had recently been addressed through the research of PCA historians including the same Rev. Dr. Lucas, Dr. Otis Picket, and Rev. Bobby Griffith (PhD cand.). According to our rules, the resolution was received by the Assembly and referred to the overtures committee whose job it is to recommend to the assembly what action should be taken on the resolution. The resolution was debated in committee for over nine hours. The predominant arguments against adoption were that the Assembly needed more time to consider this issue and that the resolution needed perfecting. There were others who argued that the PCA didn’t exist during the Civil Rights era, that individual presbyters themselves did not do these things and therefore could not confess, that the resolution seemed to cave to political correctness and white guilt, and that if prominent PCA churchmen were racists perhaps they have repented of it thus we shouldn’t call them out. Arguments for adopting the resolution were that corporate confession is biblical, we as a denomination have already delayed this for far too long, and that there are members of our denomination, including pastors and elders, who greatly desire this confession. Others also argued that we must stop hiding the past and be honest about what we did. In the course of debate, Dr. Lucas passed out a paper with quotes showing the undeniable fact that southern Presbyterian conservatives (who would later enter the PCA) actively worked against the aims of the Civil Rights movement in the church and in the broader culture. Ultimately, after the protracted debate in committee, there was first a vote to recommend adoption of the resolution that failed by three votes (37-40). Then there was a motion to refer the resolution to the 44th General Assembly (next year). This vote passed by a margin of thirteen votes (48-35). The rationale given by the majority was that a momentous resolution such as this should come from several presbyteries to give it more weight. Of course, this argument was undergirded by the other arguments mentioned above, yet this was the official rationale given. The majority also argued that the Assembly needed more time to consider Dr. Lucas’s research and that another year would allow for the perfecting of the resolution. Those 35 who voted against this recommendation in the committee formed a minority and agreed to produce a substitute motion that the assembly adopt the resolution this year. The sentiment of the minority was that referral of the resolution was effectively “punting” the issue and would line up with common critiques of the PCA on issues of race. Those common critiques are that we refuse to deal with racial sins directly but continually use diversionary arguments, such as the ones exhibited above, in order to perpetually kick the can down the road. This minority was headed up by Rev. David Richter. While the minority was forming its rationale, several members of the newly formed African American Presbyterian Fellowship approached the minority to say that they actually preferred that the resolution be referred to the next General Assembly because it would allow time to have substantive discussions and to provide more concrete ways for churches and presbyteries to demonstrate fruits of repentance on this matter. With this new information, the committee reconvened and reconsidered its motion with updated rationale. With several members of the AAPF speaking for referral, the new motion and rationale passed the committee with an 80-0 vote. However, after that vote, several other African American pastors approached members of the committee and expressed that while they loved and respected the views of their brothers, they disagreed with their opinion that the resolution should be referred. While they agreed that discussions need to continue and concrete fruits of repentance demonstrated, they greatly desired to see the Assembly confess our sins now. Some of these men, one of whom later spoke on the floor of General Assembly, expressed that there were people in their communities whom they were trying to reach with the gospel, who would not be a part of a PCA church as long as this issue was left unaddressed. As a result several commissioners who were not on the overtures committee but had observed all the proceedings, headed up by Rev. Kevin Twit, planned to make a substitute motion to the committee’s recommendation from the floor of General Assembly. The committee’s recommendation came to the floor of the General Assembly in the late session on Thursday night which began around 9PM. As soon as the committee’s recommendation was presented, Rev. Twit rose with the intention to make a substitute motion to recommit the resolution back to the overtures committee of the 43rd General Assembly. The force of this motion would be to reconvene the overtures committee so that the resolution could be adopted this year. Yet before Rev. Twit could speak, Rev. David Coffin rose to a point of parliamentary inquiry to ask that no matter what action was taken, would the resolution in all cases be referred to the next General Assembly. 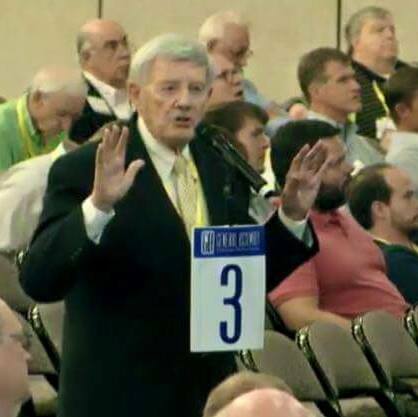 The moderator, Elder Jim Wert, then ruled that it was the case that no matter what motions were made, the only result would be that it would be referred to the next assembly. With this information, Rev. Twit then decided to make a speech against the referral. Yet the next speaker, Rev. Mike Sloan, after a point of order from Rev. Fred Greco and advice by the Stated Clerk, Rev. Dr. Roy Taylor, was able to successfully make the motion. The arguments for reconsidering the resolution this year were eloquently made by Rev. Twit, Rev. Sloan, Rev. Bobby Griffith, among others. They argued that the time for confession of sin that is acknowledged to have occurred is always now, and that if we admit that we have sinned, we should not delay but confess our sins now. Psalm 32 was appealed to, on which the Very Reverend Dr. Bryan Chapell preached the opening night of the Assembly, which says that if we delay in confessing our sins our bones will waste away. In fact, Rev. Jon Storck, during a time of prayer that preceded the vote, prayed that if our decision to refer to next year was wrong that our denomination would waste away until we confessed our sin. Speaking also for the substitute was Rev. Leon Brown, an African American pastor from Richmond, VA.
Those that rose to speak for the committee’s recommendation to refer by and large did not challenge the need for repentance by the denomination, but on the whole argued that we simply needed to return a better product that had the support of the presbyteries. On this side several African American pastors spoke, including Rev. Irwyn Ince, Rev. Lance Lewis, Rev. Alex Shipman, and Rev. Kenneth McHeard. Their main argument was that while we do indeed need to repent of our involvement in and complicity with racial injustice, we also need to make sure that whatever resolution we pass includes action items for local churches and presbyteries to correct past wrongs and work for racial justice in the future. At one point in the debate, there was a motion by Rev. Sam DeSocio to suspend the rules so that we could adopt the original resolution made by Duncan and Lucas, effectively circumventing the committee. While this was a noble attempt, it failed due to the high threshold required for suspending the rules of Assembly operation. As the discussion continued there were several points in which the time allotted for debate expired. At each point, because of the weightiness of the opinions that were being expressed, the assembly voted to extend debate. This was done so even though with the new electronic voting system these votes were anonymous. Men could have, without anyone knowing that they had done so, voted to end debate and thus shut out the move of the Spirit that was beginning to stir. Yet at each and every point the Assembly voted to extend debate so that we could continue to hear men passionately speak their hearts on this very important issue. As the debate wore on, the Assembly seemed to be agreed that we in the PCA need to confess our sins of involvement in and complicity with racial injustice during the civil rights era. And yet it also seemed that the majority wished to follow the recommendation of the committee to refer the resolution to next year’s assembly with the rationale provided by some African American pastors. That rationale was that the resolution be perfected to, “include specific suggestions with regard to the nature of the fruit of such repentance.” When the will of the Assembly became apparent, Rev. Mike Khandjian rose to a point of parliamentary inquiry to ask the moderator, Mr. Wert, if there was anything procedurally that could be done in order for the Assembly to confess our sins now, even if the resolution was referred. After conferring with the Stated Clerk, Rev. Dr. Taylor and other parliamentarians assembled on the dais, Mr. Wert replied that a possible solution would be to file a protest, and let the wording of that protest reflect such a sentiment. The idea of a protest then began to be discussed among the group of commissioners I was in communication with as a possible way forward if the substitute motion failed. When the next time period for debate expired, the substitute motion to recommit the resolution to the overtures committee of this general assembly so that they could change their recommendation and the Assembly could confess sins this year, came to a vote. When the voting opened, there was a point of order from the front of the Assembly, where Rev. Travis Hutchinson asked the moderator if we could take time to pray before the vote. Mr. Wert then gave Rev. Hutchinson and one other person, Rev. Jon Storck, the opportunity to pray. I’ve already mentioned part of Rev. Storck’s prayer, but as I remember it the substance of Rev. Hutchinson’s prayer was that the Holy Spirit come and direct our voting. He prayed that he still wasn’t sure which way was the right way to vote, and he need the Holy Spirit to come and help him and help us all do the right thing in that moment. I’ve never witnessed such an immediate and evident answer to such a prayer. The Holy Spirit did indeed come and directed us to what I believe was the best possible solution. After the two prayers the vote was taken and the substitute failed. This moved the debate back to the main motion, which was the committee’s recommendation to refer to next year’s General Assembly. If you’re still with me, this is when to start paying attention again. In short order an older gentleman rose to microphone 3 at the front of the Assembly. He identified himself as Rev. Jim Baird, one of the two living founding fathers of the PCA. Rev. Baird is also the former senior pastor of First Presbyterian Church, Jackson Mississippi, an important and historic church in our denomination. Baird delivered an impassioned speech, indeed it was a confession of sin. He said that when 12 men gathered in the early 1970’s to discuss founding a new denomination, their rationale was to do so in order to be faithful to the word of God and the reformed tradition. Furthermore, he said, none of the 12 men, including himself, were racists. Yet, he passionately and fervently confessed, when it came to supporting our African American brothers and sisters during the civil rights era, we did nothing. We did nothing to help. We stood by and watched as they were abused and oppressed and let others take up the charge. As he continued to speak and confess his, and indeed our sin, many of the men in the room began to weep. It was as if a great weight was being lifted off of us. We were finally beginning to be honest about our past and to confess it so that healing can come. I grew up Pentecostal. But that is the most intense move of the Spirit I have ever felt in my life. The presence of the Spirit was palpable as if a Holy weight was pressing down on me. Other men reported feeling goosebumps and other similar impressions. The move of the Spirit that Revs. Hutchinson and Storck prayed for was heavily upon us. This man will forever have my utmost #respect. The photo below shows, Rev. Jim Baird, a Southern Presbyterian pastor emeritus of a multi-thousand member congregation in Jackson, Mississippi and one of the original twelve men who organized the Presbyterian Church in America (PCA), confessing his own indifference to the concerns of African Americans in the past and offering heartfelt plea to see the Resolution on Civil Rights Remembrance passed this year and not get referred to next year’s Assembly. I totally agree with Jemar Tisby. I’d take a bullet for Rev. Jim Baird. WOW!!! I’ve been waiting 20 years to finally hear something like that. Super encouraged by George Robertson’s prayer as well. The next few minutes are a bit of a blur to me, but eventually the debate period ended and we came to a vote. The committee’s recommendation passed with an overwhelming majority. There were also several abstentions, of which I was one. I abstained because while I agreed that the process outlined by the committee would eventually lead us to a good place, I also agreed that we should be able to confess our sins that night, especially after they had been so clearly elucidated by Rev. Baird. After the vote, the moderator, Mr. Wert, opened the Assembly to a season of prayer. Men began flooding to the microphones to confess their sins of involvement in and complicity with racial injustice, which is exactly what the resolution asked us to do! Early on in the prayer time, Rev. Dr. George Robertson, pastor of First Presbyterian Church in Augusta, Georgia rose to pray. His church is also a historic church in the history of American Presbyterianism. The old Presbyterian Church in the United States was founded at his church in 1861. Rev. Dr. Robertson stood up and confessed his own sins but also the sins of his congregation. He confessed that his church supported slave owning, and that the African Americans were kept in the balcony away from the white worshipers. He also confessed that during the Civil Rights era, when local police beat a developmentally challenged African American boy to death in the town jail, the leaders of his church did nothing. This period of prayer lasted for about an hour as men continued to confess their sins and pray for healing. There were more men who were in line to pray, but the moderator eventually ended the time of prayer. * Still, this was the longest time of prayer that many of us, including the Moderator, had experienced at any General Assembly. This writer has attended every General Assembly the PCA has ever had. 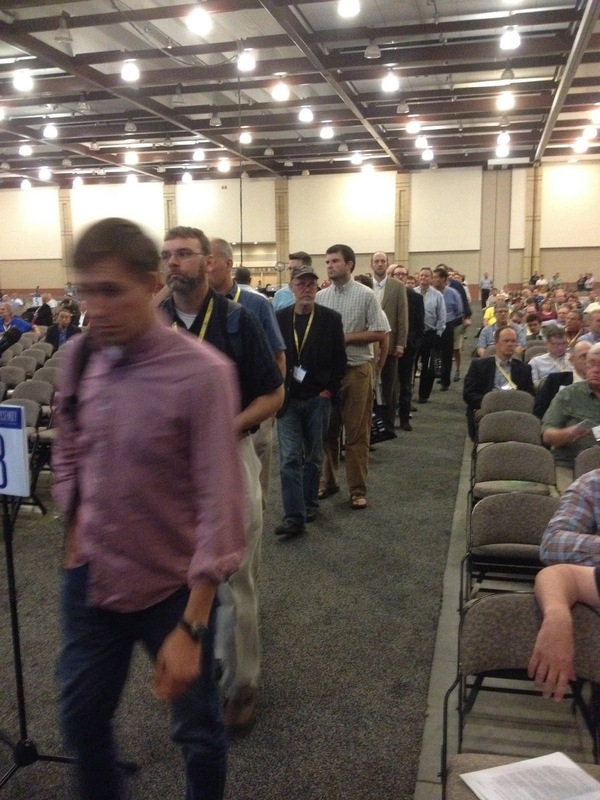 In his opinion, the periods of prayer and expressions of repentance and brotherly love on the Thursday evening session of the 2015 General Assembly were the most evident and powerful work of the Holy Spirit at any PCA Assembly heretofore. After the prayer time ended, Rev. Jon Price rose to move that we suspend the rules so that we could have another motion to the effect that the Assembly confess our sins now. As Rev. Price expected, the moderator, Mr. Wert, ruled the motion out of order because the Assembly had already voted not to suspend the rules on this matter. Then Rev. Price expressed that he wished to protest the ruling of the moderator, and Mr. Wert responded that he may do so, and that if anyone wished to join the protest, they may come to the front and put their name to it. The clerk pulled out one piece of paper and then more than 1/3 and close to 1/2 of the Assembly got out of their seats and walked up front to add their signature to the protest!!! It was beautiful. The clerks starting scrambling to try to find more paper. White delegates were repenting to black delegates while they stood in line to sign. God is good. So after approving one of the first and most robust policy statement on the protection of children last year, and then this, this year, perhaps the winds of revival are starting to stir?? Let your kingdom come, Lord Jesus!!! I don’t remember who it was, but he came up and thanked me. I still had my back to the assembly filling out the protest. I said, “You’re welcome, glad to do it.” He said, I don’t think you understand, turn around and look. I turned around, and almost shed tears. It was so beautiful to see all those men in line coming to sign their names to that repentance. One of the most beautiful things I’ve seen. I had goosebumps, and felt a deep moving of the Spirit. We the 43rd General Assembly of the PCA (the undersigned) understand that repentance is not merely a statement, but steps of faithfulness that follow. Allowing that more time is needed to adequately work on such a denominational statement, but also the need for action now, we recognize and confess our church’s covenantal and generational involvement in and complicity with racial injustice inside and outside of our churches during the Civil Rights period. We commit ourselves to the task of truth and repentance over the next year for the glory of God and the furtherance of the Gospel. We urge the congregations of the Presbyterian Church in America to confess their own particular sins and failures as may be appropriate and to seek truth and repentance for the Gospel’s sake within their own local communities. When it was all said and done, the Spirit had moved and, I believe, the best possible result had occurred. The wishes of many, including leaders in the African American Presbyterian Fellowship, were respected, that we come back next year with a resolution that is more specific and gives specific ways for churches and presbyteries to show fruits of repentance. At the same time, the desires of many, that we confess sin this year, were also answered as best as could be, given the will of the assembly. The time of confession and prayer, including Rev. Baird’s and Rev. Robertson’s confessions, and the protest signed by so many members of the Assembly, will ensure that Chattanooga 2015 will indeed go down in history as the framers of the original resolution desired. To the historic nature of what occurred: while I acknowledge that we live in a tiny corner of a small part of Christendom, this protest is significant with respect to other protests in Presbyterian history. The Disruption of 1843 that I mentioned above is certainly the most famous instance of protest in our history, and we already know that the Protest of 2015 is larger, in terms of numbers, than that one was. I am not 100% certain, and maybe readers who specialize in Presbyterian history can help me, but I think that it may be the largest protest not only in the short history of the PCA, but also in the entirety of Presbyterian history. I may be wrong about that, but I’ll let the crowd show me if I am (see my note below). At any rate, it was a historic moment. It was a holy moment. And while I am glad that we can finally be honest about our past and begin to confess it and make it right, I also agree with Dr. Bradley who asks, “Why Did It Take 50 Years For Calvinists To Care About Race?” Indeed. So while we are not proud that it took us so long, we may also be glad that the Spirit of revival is moving. Please join with me in praying that over the next year that the Spirit will continue to move and that in Mobile in 2016, we will be able to pass an overture that truly acknowledges and confesses our sins and gives us concrete ways as individuals, churches, and presbyteries to move forward in righting past wrongs and seeking racial justice in the future. Note: As mentioned above there were a total of 194 who protested in the Great Disruption. One other possible large protest was the one lead by Charles Hodge in 1861 protesting the Gardner Spring Resolutions, 58 men total signed that protest. How fitting then that the protest of 2015 dwarfs the Gardner Spring protest by a factor of four. * The Moderator, Elder Jim Wert, in a comment to me wished to expressed that he did not wish to prohibit anyone from praying, but that he had thought that everyone who had desired to pray had done so. See below in the comment section. For the sake of the peace and purity of Christ’s Church, and in preparation for the 44th General Assembly, the Committee encourages sessions and presbyteries to prayerfully consider any and all sins of racial prejudice and to pursue a proper course of action humbly, sincerely and expeditiously (Matthew 5:21–26; Ephesians 2:1–22; 4:1-32). NOTE: As recorded in the published minutes of the 43rd General Assembly, the total number of commissioners who signed the protest was 216. Office of the Stated Clerk of the General Assembly of the Presbyterian Church in America, Minutes of the Forty-Third General Assembly (Lawrenceville, GA: 2015): pp. 71-77. What a great summary, Tim. Just one small correction. In the overtures committee, the vote on the personal resolution (which was a substitute to the substitute–long story) was 37-40, which meant it failed. The vote on the main motion to defer was 48-35. Just about all 35 in the minority were prepared to sign the minority report if it had gone forward. And then, as you say, on Thursday, there was a move to reconsider the main motion to make it unanimous. Sean, I corrected it. See if it reads correctly now. Tim, Thanks for your record and reflection on this important moment in our denominational history. However, in reference to paragraph 3, I don’t think the majority of those that spoke against adopting the personal resolution in the overtures committee would recognize their arguments as you have characterized them. Though these statements were indeed included (though I don’t recollect anyone attributing the resolution to “white guilt) my sense from topics that were spoken on most was that many wanted to repent as fully and particularly as possible and felt that the resolution did not meet that threshold. There were also a number that felt that the resolution would be better received through a session or presbytery to bring weight behind it, with specific suggestions for action. I’m not advocating their position but being a member of OC that voted among the 37 against the motion to recommit, I would not want my brothers in the 40 to feel mischaracterized. Thank you, Ian. As I mentioned to Sean, I was relying on other first hand accounts as I was not in committee. I will consider editing my post to reflect the spirit of what you said. Tim, thank you for this thorough and balanced recap of the discussions, debate and responses to the Duncan/Lucas personal resolution on racial injustice and repentance. This will be a valuable synopsis toward which we can point many in our presbyteries and churches as they hear (and pray) more about this important dialog at this year’s Assembly. My only edit would be that, as far as I could determine, we left no one standing in line at a microphone who still wished to pray after we had concluded our voting on this resolution. That was, at least, my intent. I apologize to any that I may have missed. Thank you, Mr. Moderator (can I call you Jim?) I will certainly check on that. I do have at least one account that said there were more men standing ready to pray, I’ll look for more to confirm. But again, I’m certainly not implying that you didn’t want them to pray, and I appreciate you saying that you did not wish to cut anyone off. It’s possible, Tim. I know some folks stood, and then later sat down. Regardless, the prayer was substantial, Spirit-filled, gracious, real, sometimes raw, and necessary. Jim, agreed. My intention in reporting on that fact was to emphasize that the move to pray was even more than could be contained in that meeting, not to suggest in any way that you cut off the prayer time. You were the one who originally suggested it! Thank you for that, sir! Thanks for the summary. Encouraging and informative. Tim, I want to thank you for giving us this summary. For those of us that weren’t able to be there it gave us a sense of exactly what happened. Thanks for the hard work. Thank you for your hard work in compiling this summary. May God continue to pour out His Spirit upon us! As a church planter just moving to the field I was unable to attend GA this year. I am indebted to you for this thorough account of Thursday nights proceedings as I am sure many others are and will be. Thank you and by God’s grace may this move of God’s Spirit continue. Tim, your work on this report is greatly appreciated. I’m so proud and moved by our denomination. While the work of repentance seems late to me, I’m sure God has the timing worked out perfectly. This post is the first I’ve ever re-blogged and am now pointing our church and others to your resource. Again, very grateful. Thank you so much for this great recap for those of us not able to be there. May the Holy Spirit continue moving in our midst to be more disruptive in a honoring and fruitful way! Is there a link to Dr. Lucas’s research? Tim, thank you for the time and care you employed to offer this. I’m renewed in my courage to further pray for this kind of movement by the Holy Spirit among us. Thank you for this excellent synopsis. How encouraging to see the Holy Spirit move as we (corporately) confess our sins! Although reformed, I’m not a member of the PCA, but I loved reading this account of the Holy Spirit’s moving in the hearts of men. May He continue to bring glory to the Lord Jesus Christ in causing all men everywhere to confess and repent of their sins!